These Control Earrings are simple but clever, and very cute for mixing and matching. Would probably also look great in multiply-pierced ears. 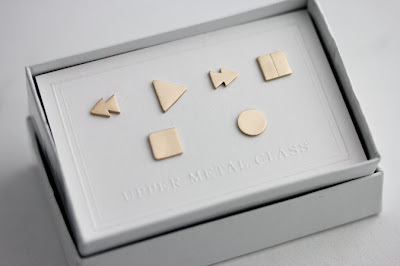 I also must say that I love the shop name: Upper Metal Class. I almost want to buy something for the name alone. Oh, and if the aforementioned earring set isn't your thing, the designer is also selling Triforce earrings. Sure, they're called Kylee Earrings, but they're obviously Triforces.